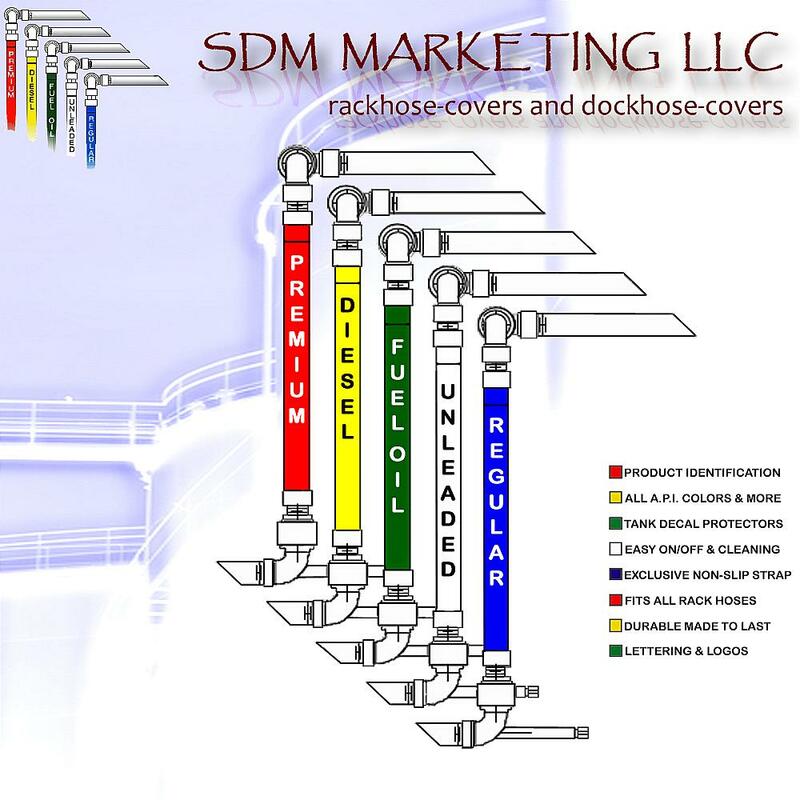 SDM Marketing Company manufactured and sold their first “Rackhose-Cover” over 20 years ago. The primary purpose for the covers is to simplify the driver’s ability to visually identify the petroleum products per each loading arm quickly. In addition, they prevent unsightly scuffs to the costly tank logos and protect drivers from possible injuries caused by protruding wires on hoses. Since that time, SDM Marketing Company has been supplying “Rackhose-Covers” to all the major oil companies within the United States, as well as many other countries. SDM Marketing Company is also the preferred choice of the major loading arm manufactures. “Rackhose-Covers” are available in all API-1637 and CPPI color-codes; along with other color options and multiple color code combinations. The covers are custom made to fit over Composite, Metal Flex or Rubber style hose, as well as pipe. Other lengths and widths are available at the customer’s request. We also offer lettering to identify the fuel products being transferred, in addition to company logos. “Rackhose-Covers” are easily applied by using a heavy duty marine grade nylon zipper closer, along with a slip-resistant tightening strap at the top of the cover. “Rackhose-Covers” are simple to maintain to keep your terminal clean looking and worker friendly.